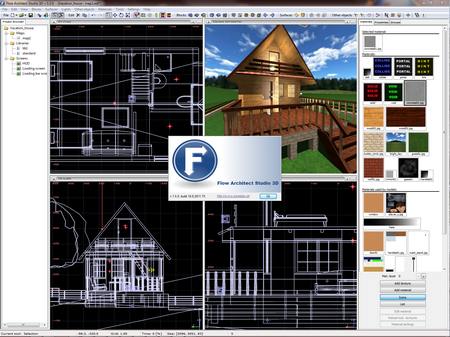 Flow Architect Studio 3D was available as a giveaway on September 12, 2012! 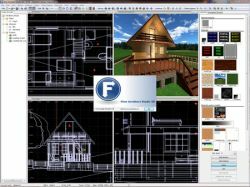 Flow Architect Studio 3D is a software package for design and presentation. It enables you to design and visualize any scene you need in 3D, for example: buildings, interiors, spaces or your products. Flow helps you to present your work to others with screenshots, movies and a 3D real-time virtual walk. Virtual walk is a real-time interactive presentation that can take a form of an application in a single executable file or an O4C file. A visualization in a form of an application can be shown to your clients or audience and shared through a website. sharing: generates redistributable visualizations, share your project and make presentations. Library explorer: import models, create and edit materials, import textures. 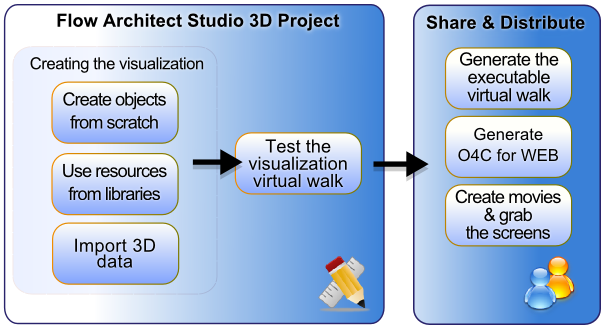 The 3D engine: preview visualization as a virtual walk, take screenshots, record paths and movies. How would you improve Flow Architect Studio 3D? "If you are aware of a bug in the OGL implementation of specific versions of drivers for specific chipsets then you have all you need to institute a workaround! When launching your app you must enumerate available 3D chipsets and what OGL versions are supported, all you need to do is make the specific OGL API call optional so you don’t have to use the buggy feature if you cannot find a way to use the API without exposing the bug… Or even make your application capable of using Direct3D API or OpenGL… the whole point of workaround is to WORK AROUND the bug, NOT require the user fix the bug or wait until the bug is fixed externally… work around it!" In general you are right. We have it mentioned in Flow FAQ on our web page but maybe it needs more exposure. Intel has already fixed this but Sony have not updated VAIO drivers. There is very little that we can do. We have tried to find a workaround but the nature of a problem is such this is not possible without working directly with a driver vendor. "If you are aware of a bug in the OGL implementation of specific versions of drivers for specific chipsets then you have all you need to institute a workaround! When launching your app you must enumerate available 3D chipsets and what OGL versions are supported, all you need to do is make the specific OGL API call optional so you don’t have to use the buggy feature if you cannot find a way to use the API without exposing the bug… Or even make your application capable of using Direct3D API or OpenGL… the whole point of workaround is to WORK AROUND the bug, NOT require the user fix the bug or wait until the bug is fixed externally… work around it!" In general you are right. We have it mentioned in Flow FAQ on our web page but maybe it needs more exposure. Intel has already fixed this but Sony have not updated VAIO drivers. There is very little that we can do. We have tried to find a workaround but the nature of a problem is such this is not possible without working directly with a driver vendor. If you are aware of a bug in the OGL implementation of specific versions of drivers for specific chipsets then you have all you need to institute a workaround! When launching your app you must enumerate available 3D chipsets and what OGL versions are supported, all you need to do is make the specific OGL API call optional so you don't have to use the buggy feature if you cannot find a way to use the API without exposing the bug... Or even make your application capable of using Direct3D API or OpenGL... the whole point of workaround is to WORK AROUND the bug, NOT require the user fix the bug or wait until the bug is fixed externally... work around it! #38, Pixelplan: If you are aware of a bug in the OGL implementation of specific versions of drivers for specific chipsets then you have all you need to institute a workaround! When launching your app you must enumerate available 3D chipsets and what OGL versions are supported, all you need to do is make the specific OGL API call optional so you don't have to use the buggy feature if you cannot find a way to use the API without exposing the bug... Or even make your application capable of using Direct3D API or OpenGL... the whole point of workaround is to WORK AROUND the bug, NOT require the user fix the bug or wait until the bug is fixed externally... work around it! As for installation - slightly "old fashion" feel (icons in the bin), consisting of few different programs, so yet to discover what does what, what goes where a.s.o. Thank You Ton (mainly) and others for much needed here professional view, as this is not perhaps widely "popular" Software offered here on GAOTD, but deserving it's presence just the same. The O4C viewer, and the browser plug-in contacts pixelplan.pl in order to check for automatic update (just as Flow and any other application today does). I beg your pardon ... I understood no updates are available for this GAOTD or and any other application or software. <i>The O4C viewer, and the browser plug-in contacts pixelplan.pl in order to <b>check for automatic update</b> (just as Flow and any other application today does). </i> I beg your pardon ... I understood no updates are available for this GAOTD or and any other application or software. Is this a new policy? First off I am amazed at the negative/ridiculous comments (and votes) about this software. Anyways this does what they say it will do and more, can't get into it right now (even if I did you wouldn't bother reading it because it would be too long!). If you need a program such as this then download it now and spend the time to learn it because it's well worth it! I believe they are only giving this away because it is not well known and they want to get a larger audience to view their work of art! Yes I am hyping this up, only because I believe this is one of the best softwares in it's category, and is well worth it's asking price, and it needs to be said! I will bet you will not see a similar one on this site (or anywhere for the price) this year! Thank you Pixelplan for your generosity! Thank you Gaotd for getting this! First off I am amazed at the negative/ridiculous comments (and votes) about this software. There is nothing negative about this software (unless you don't need it, which you should just ignore it but you won't so you'll vote it thumbs down! right!) Anyways this does what they say it will do and more, can't get into it right now (even if I did you wouldn't bother reading it because it would be too long!). If you need a program such as this then download it now and spend the time to learn it because it's well worth it! I believe they are only giving this away because it is not well known and they want to get a larger audience to view their work of art! Yes I am hyping this up, only because I believe this is one of the best softwares in it's category, and is well worth it's asking price, and it needs to be said! I will bet you will not see a similar one on this site (or anywhere for the price) this year! Thank you Pixelplan for your generosity! Thank you Gaotd for getting this! #42, I-Glow: Ton made no error, the proof is that the overlay states "unblocked (Trial version)" the activationm data can be clearly seen in the Help menu, Enter the registration Key panel. AND it says unlocked on the startup box that you have to dismiss at application startup. Please try it yourself and generate a standalone exe visualization of one of the sample scenes and see for yourself before trying to ridicule a poster that has at least used the program and given their opinion of their experience! I too experienced the same as Ton but I am even less impressed as they should have given us the comercial installer not the trial installer that you can just as easily download from their website and is bit for bit identical to the one downloaded from here today. #42, I-Glow: Ton made no error, the proof is that the overlay states "unblocked (Trial version)" the activationm data can be clearly seen in the Help menu, Enter the registration Key panel. AND it says unlocked on the startup box that you have to dismiss at application startup. Please try it yourself and generate a standalone exe visualization of one of the sample scenes and see for yourself before trying to ridicule a poster that has at least used the program and given their opinion of their experience! I too experienced the same as Ton but I am even less impressed as they should have given us the comercial installer not the trial installer that you can just as easily download from their website and is bit for bit identical to the one downloaded from here today. Well, its ashame PixelPlan isn't MORE focused on the CAD aspect, as there really is more R.O.I. when one can actually MAKE something from one's designs. Making it look "pretty", however many "D's" only serves for selling the design. How does this compare to Google SketchUp? #38 thanks, but I have an AMD cvard and getting the same error message, this is on a full size PC, not a netbook. #39 my manufacturers website tells me I have the latest drivers. #38 thanks, but I have an AMD cvard and getting the same error message, this is on a full size PC, not a netbook. #39 my manufacturers website tells me I have the latest drivers. Oh well. When I run it it tells me it is opengl software and I need to install the latest graphics drivers. I know I have the most current AMD drivers installed, but the software instantly exits. Any thoughts? To the developer: You can break Sony's rules of proprietary drivers by downloading the zip file package that is intended for developers and installing them from the control panel from the Intel Support Site. Its not the best trick in the book but it works! Then found out activating the software needs to be done without admin. Thanks for pointing out the flaw in my review. I do apologize for that. 42 I-Glow I installed with Admin, ran Activate with Admin It didn't work initially. Then found out activating the software needs to be done without admin. Then it worked. Thanks for pointing out the flaw in my review. I do apologize for that. Very nice :) Sometimes I like a good challenge, and this will definitely be a fun and rather difficult (yes, difficult b/c I'm not exactly an expert with stuff like this...) task to play around with for a little while. Thanks GAOTD and Pixelplan! @38: When I try to run this program, it simply states "A problem caused the program to stop working properly. Please close the program". I'm given no other option or reason, simply a "Close" button. Is this related to the Vaio driver issue or something else? I'm running Win 7, with Admin rights, etc. installed with WinZip as a trial version on a different partition than my system files. The Activate.exe and Activate.gcd address C:\Users\Admin\AppData\Local\Temp\Activate.exe, had to extract those two activate to the actual installed location. After activation there are tedious nag popups. Had to pull a shortcut (flow.exe) from the bin folder. Seems the program fails to provide a print function, making the program rather less than useful. 12.9.12 using the share your ideas - submit comment process is bogus, it does not accept the enter code #s it requires to add comments, (using chrom browser) I would like to... suggest an idea installed through windows 7, Flow Architect Studio 3D v 1.7.1, client is 72MB installed with WinZip as a trial version on a different partition than my system files. The Activate.exe and Activate.gcd address C:\Users\Admin\AppData\Local\Temp\Activate.exe, had to extract those two activate to the actual installed location. After activation there are tedious nag popups. Unchecked splashscreen in settings/global settings/startup Had to pull a shortcut (flow.exe) from the bin folder. Seems the program fails to provide a print function, making the program rather less than useful. There are some mistakes in informations about demo version in polish language. There are some mistakes in informations about demo version in polish language. "Ogranioczona" - "Ograniczona" "Obejżeć" - "Obejrzeć"
in my external harddrive due concerns over new wrapper! is highly used and rest infrequent and some bloatware! main computer! Thanks gotd and Pixelplan P.C. Well, I installed the into backup files - program files in my external harddrive due concerns over new wrapper! Works, but gonna have fiqure software out! Looks to be an interesting software! Due to new wrapper started to install all software into my external hardrive 1st, to be tried out! I come to conclusion 20% of stuff I get is highly used and rest infrequent and some bloatware! If software turns out useful, I will make copy and put on main computer! Thanks gotd and Pixelplan P.C. GUESS WHAT? I just installed this, and within 15 minutes, I had designed my dream home. In fact, the construction workers are building it right now. Thanks, GAOTD! This program creates secretly Plug in Pixelplan Web Viewer in Firefox- which sends all information in Your pc and all surfing history and opened interenet connections -to polish company pixelplan.pl. Plug in is impossible to delete- You must reformate Your pc, to remove it"
This of course is not true. O4C Viewer does not send "all information" to pixelplan.pl. Is allows you to open O4C files that Flow can generate. The O4C viewer, and the browser plug-in contacts pixelplan.pl in order to check for automatic update (just as Flow and any other application today does). The new version of O4C viewer will be able to open almost all common 3D file formats. So it will also work as a free 3D model viewer. You can uninstall all Pixelplan software if installed from our install. I'm not 100% sure how GOTT installer works. "Warning . This program creates secretly Plug in Pixelplan Web Viewer in Firefox- which sends all information in Your pc and all surfing history and opened interenet connections -to polish company pixelplan.pl. Plug in is impossible to delete- You must reformate Your pc, to remove it" This of course is not true. O4C Viewer does not send "all information" to pixelplan.pl. Is allows you to open O4C files that Flow can generate. The O4C viewer, and the browser plug-in contacts pixelplan.pl in order to check for automatic update (just as Flow and any other application today does). The new version of O4C viewer will be able to open almost all common 3D file formats. So it will also work as a free 3D model viewer. You can uninstall all Pixelplan software if installed from our install. I'm not 100% sure how GOTT installer works. 1) That "Polish company" is the manufacturer of this software. 2) The plugin enables the program's output to be displayed in web browsers. See Objects for Clients. Where is your evidence that it sends information from your PC to the company? @Roy (#40): 1) That "Polish company" is the manufacturer of this software. 2) The plugin enables the program's output to be displayed in web browsers. See <a href="http://www.pixelplan.pl/index.php?id=products&amp;section=o4c_web&amp;lang=en" rel="nofollow">Objects for Clients</a>. Where is your evidence that it sends information from your PC to the company? @ #9, Ton, with 15 years of experience and a Autodesk certified professional you didn't activate the software! You have to install (run setup) then run the activation and you have a full unlocked version. My best guess is that with all of your experience you didn't learn to follow directions. It causes one to pause about how much stock we should put in your review. Oh well, I wasn't aware of that bug. Ignore my previous comment on that. Installed and registered without problems on Win 7 64-bit. I also didn't have problems with my OpenGL drivers. Just go to the official site of your video chip/card manufacturer and download the latest OpenGL drivers. Or use a program like Driver Magician or the likes. Not my cup of tea as I don't have any practical use for 3D programs but I'll be spending many free hours with this. Lots of options and features. Probably not up to par with CAD but that's not really the purpose of this program. The GUI is a bit overwhelming but all 3D programs have that. It's not an easy thing to do. Nevertheless, if you get past that stagefright it becomes real fun to play with. I'm wondering how many GOTD visitors will actually get some practical use out of this but definetely a keeper as far as I'm concerned. Thanks GOTD and Pixel Plan. Installed and registered without problems on Win 7 64-bit. I also didn't have problems with my OpenGL drivers. Just go to the official site of your video chip/card manufacturer and download the latest OpenGL drivers. Or use a program like Driver Magician or the likes. Not my cup of tea as I don't have any practical use for 3D programs but I'll be spending many free hours with this. Lots of options and features. Probably not up to par with CAD but that's not really the purpose of this program. The GUI is a bit overwhelming but all 3D programs have that. It's not an easy thing to do. Nevertheless, if you get past that stagefright it becomes real fun to play with. I'm wondering how many GOTD visitors will actually get some practical use out of this but definetely a keeper as far as I'm concerned. Thanks GOTD and Pixel Plan. Thanks for all the comments the good ones and the bad too :) We appreciate all input. As far as crashes are concerned there is a bug in OpenGL Intel driver for some Intel GPUs that is exposed in Flow. We have no workaround for this other than installing new drivers. Unfortunately this is not possible on VAIO because Sony have not released new drivers and you cannot instal Intel driver on VAIO. Good morning everyone. We were not able to install this due to the exclusive support for 32 bit and not a 64 bit system. Had tried everything but it did not run. #32 : vc : Your Netbook obviously may not be able to run this due to the pixel shading, vertex shading / hardware transform and lightning not present on your particular hardware on the Netbook. However if you are just using the Netbook Screen, and you have an AMD Radeon or Nvidia ION and you still get this, chances are you may need to plug into an external monitor to get it to work. Good morning everyone. We were not able to install this due to the exclusive support for 32 bit and not a 64 bit system. Had tried everything but it did not run. #32 : vc : Your Netbook obviously may not be able to run this due to the pixel shading, vertex shading / hardware transform and lightning not present on your particular hardware on the Netbook. However if you are just using the Netbook Screen, and you have an AMD Radeon or Nvidia ION and you still get this, chances are you may need to plug into an external monitor to get it to work. Same as Anna. Win7 - Installed, activated, run = Modal Dialog with message "OpenGL version error, please install the latest graphics drivers." Upon clicking "OK" the application exits. when You generate the view.. it is NOT registered. It says trial version in a streamer that runs down over the view. @#26: Without further explanations, your posting is kind of pointless. "OpenGL version error, please install latest graphics drivers"
No problem install to Windows 7 64bit. Activation ok need to have the activation programs in the same directory as the Main program. I use 7-zip for compressed files. Seems to be lite cad good for games. How about adding anaglyphic sight for real 3D feeling. Suggestion for improvement: How about adding anaglyphic sight for real 3D feeling. Without collada (.dae) export, this app is kind of pointless. I like this kind of software... couldn't wait to fire it up. Installation on windows 7 ult... ok, except the executable is hiding in the bin folder. Interface fairly straightforward.. the font on the side panel tabs could be a hair larger for those of us that are vision challenged. I could move (but not rotate) objects in scene, including objects added to the scene - the gizmo for object manipulation just disappeared. Texture and materials are also not accessible. Maybe I need to go through more of the tutorials but not being able to create a new project limits program eval. I like this kind of software... couldn't wait to fire it up. Installation on windows 7 ult... ok, except the executable is hiding in the bin folder. Interface fairly straightforward.. the font on the side panel tabs could be a hair larger for those of us that are vision challenged. I was unable to start a new project, the program would only let me explore 4 test projects... not good for an eval. The create option is dimmed out on the project menu panel and the right hand side of the location field does not have the file browser button, so computer location requires typing it out or pasting it in. (took screenies) I could move (but not rotate) objects in scene, including objects added to the scene - the gizmo for object manipulation just disappeared. Texture and materials are also not accessible. Maybe I need to go through more of the tutorials but not being able to create a new project limits program eval. I am having big problems with this program. When I try to start a new project, I am using the help menu tutorials, but when I minimize the help menu, it stays in the plan windows. Every new item I click on also remains in the plan windows, and I cannot even get anything to work on the plan, not even block by range. Any suggestions? I have been using trueSpace for years (FULL 3d and animation program--including redering and collaboration). It was developed by Caligari and eventually sold to Microsoft who then offered it to the world FREE (I paid $800 about 12 years ago)! It has a significant learning curve, but MANY video tutorials and libraries. Everything is free now. Had a great, active community. Still has a forum, but since it is no longer being developed (stopped at Win 7), a lot of old faithfuls moved on. It does everything any professional 3d program does. I have been using <b>trueSpace</b> for years (FULL 3d and animation program--including redering and collaboration). It was developed by Caligari and eventually sold to Microsoft who then offered it to the world FREE (I paid $800 about 12 years ago)! It has a significant learning curve, but MANY video tutorials and libraries. Everything is free now. Had a great, active community. Still has a forum, but since it is no longer being developed (stopped at Win 7), a lot of old faithfuls moved on. It does everything any professional 3d program does. A good software that I didn't have to steal - THANKS! One thing which would be great for this is to allow custom screen aspect ratios. Another feature request would be to cache shadow maps for re-use. both are free and have indie licensing with no upfront fee at Crytek, but I believe 99 bucks at UDK per seat. Crytek is charging 20 percent of all revenue. That's all there is to Crytek Licensing - easy. 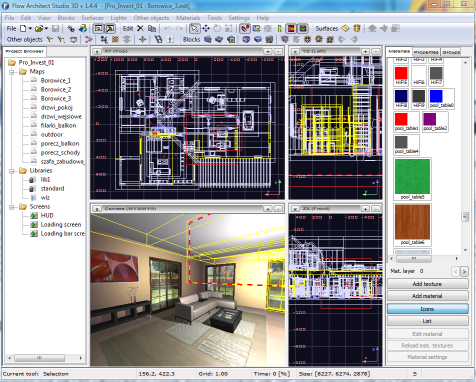 To folks who say that the learning curve is steep for this software, try Sweet Home 3D. 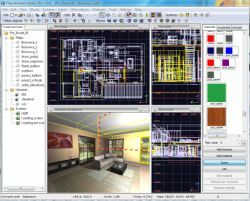 It has fewer features than the software offered today but you can be designing interiors within minutes.